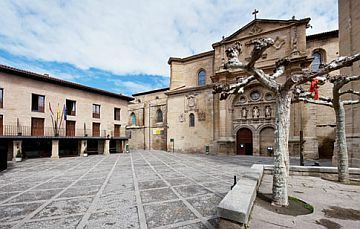 Santo Domingo de la Calzada is located in the northern region of La Rioja along the Oja River at the foot of the Sierra de la Demanda hills. La Rioja’s cuisine and excellent wines might be enough in itself to attract you to this area, but Santo Domingo with its maze of medieval streets and historical buildings certainly makes an excellent place to base yourself. There is quite an interesting story behind the city’s humble beginnings and in particular its founder, Domingo Garcia. Born in 1040 he decided to devote his life to God and tried to enter various monasteries in the area but was never accepted. So instead, he became a hermit and lived in the forest where Santo Domingo de la Calzada now stands. He used to watch the hundreds of pilgrims, on route to Santiago de Compostela, struggle as they tried to cross the Oja River. Many too weary or ill to carry on, he took it upon himself to establish a place for them to rest, thereby giving Santo Domingo a significant role in this important pilgrimage. He began by building a bridge across the river and a hostel where the pilgrims could rest for the night. Later he established a hospital to treat the sick, and over time he accumulated quite a following who in fact continued his good works long after he died. Receiving approval from the King for his efforts, he was awarded a small piece of land where he built the very first church in Santo Domingo. Sadly that church no longer exists but a century later in 1158 a Romanesque Cathedral was erected. It was designed in a typically pilgrimage church style with several chapels and a passage at the front that made circulation of large numbers much easier. The altarpiece was created by Damien Forment, a well known sculptor of the Renaissance era, and this was one of his finest works. It was also the only one he ever made out of wood and stands 9m wide by 13m high. In the centre of the cathedral is the beautiful walnut choir plateresco. The original bell tower was destroyed by lightening during the 15th century and was replaced with another tower which was eventually taken down because it became too unstable. To avoid this happening again they chose a much more stable location, and this is why the Baroque style bell tower that you see today is separate from the main building. The tower has become quite a landmark in this area and can be seen for miles around. Near the tomb of Santo Domingo de la Calzada is a cage that houses a rooster and a hen. Birds have been kept in the cathedral since 1350 following a great miracle that took place. The story goes that a young man travelling through Santo Domingo was approached by one of the girls who worked in the local inn. When she realised he was not interested in her she decided to take revenge and framed him by placing some silverware in one of his saddle bags. Accused of stealing he was then promptly arrested and hanged. That night when his parents came to collect his body they found to their amazement that he was still alive. They ran to tell the Major who was enjoying a roast chicken at the time, and when he sneered at their story the chicken suddenly came back to life and flew off the table. Of course, news of this miracle soon spread across the land, and from then on birds were kept in the cathedral as a reminder of this astonishing event. Thankfully, you may be relieved to know, the birds are actually replaced with new ones every month. You can still visit the house of San Domingo and if you do you must take a look at the guest book, which in itself is of great historical interest. 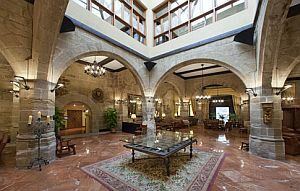 The old hospital has since been converted into a four star hotel, the Parador Hotel Santo Domingo de la Calzada. It’s been extremely tastefully done and almost like going back in time with its Gothic arches and stained glass windows. In 1367 King Peter of Castile built a fortified wall around the city and although only parts of it remain today is still the largest in the region. Twelve towers are still in existence, as well as three of the original entrances. The main one is the Arco de la Carrera, which is located near the Town Hall in the old market square. The Convent of San Francisco was established in the 17th century by the Archbishop of Zaragoza who was the confessor of King Philip II. Its founder was a very cultured man who not only created the convent but also the College of San Buenaventura, with the intention that one day the convent would become a University. Today part of the monastery is used as a residential home for the elderly, and the rest has been turned into a workshop restoring works of art and a museum displaying religious art. Santo Domingo hosts many celebrations throughout the year, particularly around Easter. Before the official start of the holidays the Brotherhood of the Holy, along with two pipers and a drummer, walk the streets of the city and paint blue on the faces of all the young boys and girls who participate in the procession of the Holy Bread. Each of the festivals can include anything from torch processions, bonfires, and lots of live music, to entertainment for the children and all sorts of food tastings. So there is something for the whole family to enjoy. December is also a very special time to come, as this is when the Conception Fair is held. It first began in the 13th century and is usually around the beginning of the month attracting thousands of visitors to the city each year. The exhibits include a Medieval Market with people in costume, magicians and jugglers, as well as cooking events, horse shows, dancing, and even a game of living chess. It not only offers wonderful entertainment but a very special atmosphere.